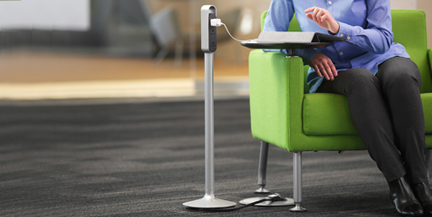 Access to flexible power options is becoming a key concern in today’s workplace. Whether it’s a simple space reconfiguration or the need to boost access to power in an older space, there are several solutions to achieve flexible, reconfigurable power. Flat wire technology allows for power to run seamlessly under carpet tile making it easy to camouflage but there are also raceway options that are highly functional and will ensure that your power solution will not be a safety hazard. Here are 4 technology options that will boost your access to power without the expense and inflexibility of core drilling, trenching or floor boxes. 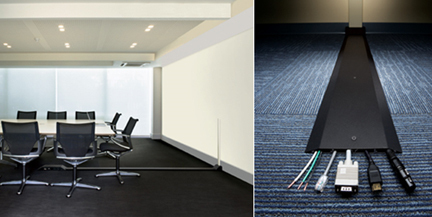 The ultra-low-profile Connectrac wireways ensure connectivity and power access in two ways, either “in carpet” or “on floor”. 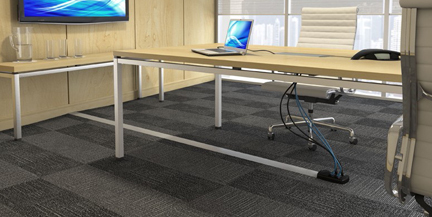 The Connectrac In-Carpet Wireway offers discreet power and technology connectivity combining an extruded aluminum central wireway flanked by ultra-low sloping floor transition ramps, creating a subtle cable pathway solution. 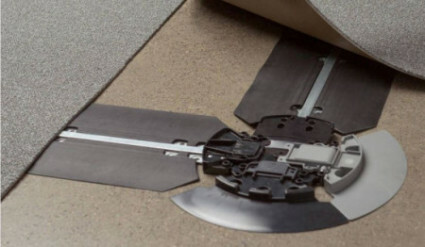 The Connectrac On-Floor Wireway system installs directly on top of any type of flooring. Extremely durable and low-profile, the wireway offers a wide array of connectivity options. Formerly Tyco Amp Netconnect, this solution involves using a completely flat copper cable channel that is field cut and can be used under carpet tiles. 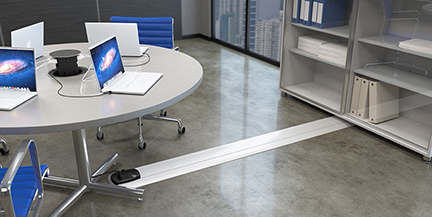 Wiremold OFR Series Overfloor Raceway System provides four-channels of capacity and access to a wide range of power, communications, and A/V connectivity options in the smallest, lowest, narrowest, ADA compliant profile available in overfloor raceway systems. This system installs over existing floor coverings and is both tamper-resistant and installer-friendly, making it an ideal solution for relocatable or permanent installations where access through floors and ceilings is not an option. Thread offers a workplace solution that is ultra thin and lays nicely underneath the carpet. At a height of just 3/16″, Thread’s power track seamlessly integrates into a space, providing power to furniture and users, without impacting foot traffic. Installing Thread is as easy as laying carpet, with modularity that makes it easy to reconfigure. Power can easily be added to new construction or retrofitted into existing spaces. And lastly… here’s a summary of all four options! Need help? Our technology team has the expertise to answer any questions you may have. Contact us!